When UNC Charlotte was exploring the addition of football, it reached out to athletic directors and provosts at other institutions for advice and asked each a set of questions regarding their own experience. This was done prior to UNC Charlotte’s 2008 vote to add football, so the landscape of major college football looked a little different. Nonetheless, it’s still interesting to see UAB’s responses in light of yesterday’s news that the football program is being cut. In particular, the acknowledgement that the football program wasn’t built on the most solid ground at its inception. 1. What is your perspective on the implementation of the Football program (or lack of implementation)? 2. What were the consequences both intended and unintended with the implementation of football (or lack of implementation)? 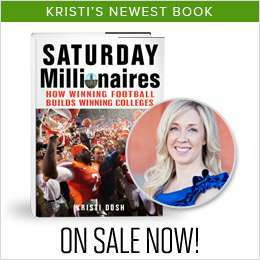 “Unintended Consequences – On the front-end there was a miscommunication with the Trustees in regard to the goals of adding football. There is a need to have ownership from the “top down”—– total buy in. UAB has that now, but not sure we (UAB) did originally. 3. 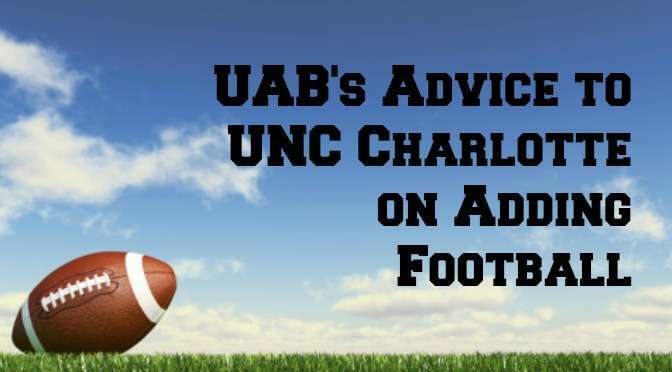 Is there any advice that you would give as UNC Charlotte studies football? “What Joe Gottfried did at South Alabama was smart……had a plan to sell a minimum # of season tickets prior to committing to start football. UAB just jumped in with no plan. You need a plan due to economic impact unless your President/Chancellor will subsidize the program at $4-4.5 million per year. I know you are aware of Title IX consequences. If you don’t know, UNC Charlotte did decide to add football. The 49ers played their first game in 2013 and will move up to FBS next fall. I am an engineer looking for some information online about the expenses that go into a college football team for a business i am trying to start and it brought me here. Funny thing is when I saw this article I had to read it because I am an UAB graduate and I used to be on scholarship playing football there. This whole situation angers me. We have never been in control of the football program, and now you have seen the next step, no football. Funny how this happens the first year we are eligible to participate in bowl game in 10 years. I went to the UA board of trustee meeting a couple of years ago when we were trying to get funds for a stadium with 200 or so other UAB students, and they wouldn’t even talk about it, but 10 minutes later when funds were requested for a frat house on UA’s campus this was granted, and I talking about a few million. We need to do what UNC Charlotte did when they separated from UNC. Only thing that they dont tell you is that UAB is the largest money maker in the STATE of Alabama and the biggest employer. I know I wouldn’t want to give that up if I was UA. It is time for UAB to move on!